The saying “what you see is what you get” has never been more true in reference to a recent film than it is when talking about Jon Favreau’s Cowboys & Aliens. I personally found it to provide a fun mid-summer diversion, but previous appreciation of either genre certainly won’t hurt when it comes to finding entertainment value in this blockbuster. The sci-fi western opened to mixed reviews and reasonably good box office earnings of $36.4 million over the weekend, beating those ridiculous Smurfs by less than a million dollars for first place. In the opening scene of Cowboys & Aliens, Jake Lonergan (Daniel Craig) is in the middle of the desert with no recollections of who or where he is, with his only evidence being the mysterious metal weapon attached to his wrist. When he rides back into the Old West town of Absolution on a stolen horse, the question of whether he is a hero or outlaw remains. The town takes orders from an iron-fisted rancher named Colonel Dolarhyde (Harrison Ford), and naturally the residents don’t take well to strangers. But things are turned upside down when people start being taken hostage by mysterious aircrafts flying over the small town. Jake and a group of locals set out on horseback to track the strange creatures, as the story transitions between the science-fiction overtones and the authentic western setting. Also along for the journey is the mysterious Ella Swenson (Olivia Wilde), who knows more about the situation than she initially lets on and might just hold the key to saving the town. Daniel Craig has a similar screen presence here as he does in the James Bond films, once again proving himself as an appealing action star who can take down the bad guys with or without the aid of a weapon. Harrison Ford doesn’t crack a whip but still seems to be playing up his legendary Indiana Jones persona, and honestly fits in quite nicely with the rest of the cast as he has a lot of fun with the role. Olivia Wilde is already known to fanboys as Quorra in last year’s visually stunning Tron: Legacy, and here the actress gets plenty of moments to turn the tables and hold her own alongside her male co-stars. Whether it was the beloved Christmas comedy Elf, the kids sci-fi adventure Zathura or the two Iron Man films, Jon Favreau has previously delivered some very good efforts as a mainstream director. He brings a sincerity to whatever genre or story he is trying to tell, even if it is does sound as ridiculous as putting aliens in the middle of a western. 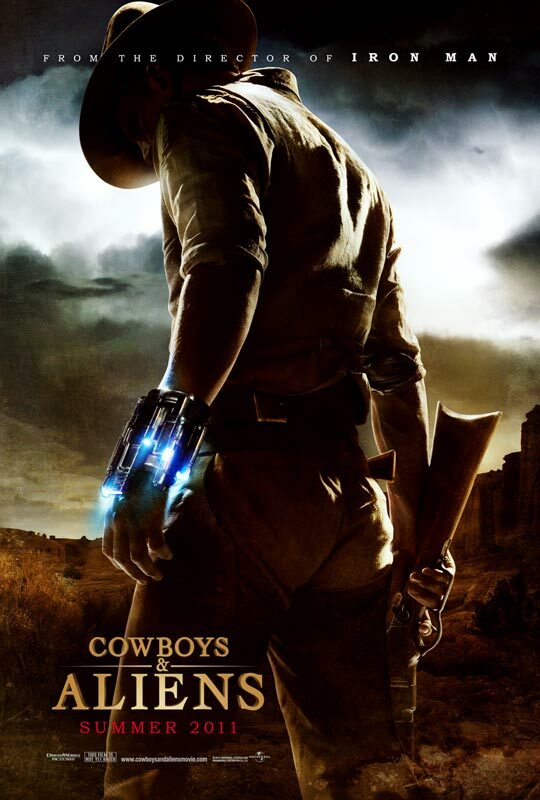 But if you buy a ticket to Cowboys & Aliens merely based off of the openly descriptive title then you likely won’t be disappointed with what you get, even at times when it does pay tribute to many western clichés. I’ve always enjoyed the style of an old western and often find it easy to get entertainment value out of a good science-fiction story, so perhaps this did add to my enjoyment of the film. Of course it’s not in the same high league as last year’s excellent western True Grit or the recent Super 8, but Cowboys & Aliens never loses sight of its modest ambitions to entertain the audience. Perhaps the mix of genres proved too jarring for many critics and the film does sometimes play better as a straight western. But Jon Favreau should get points for at least trying to deliver something that we haven’t quite seen before by putting aliens in an old west town. It is possible to find imperfections in the script and be left wanting a few more details as to why the aliens are invading. The amount of alien gore on display and the sometimes cheesy special effects also won’t be for everybody. But how can you really say that Cowboys & Aliens doesn’t deliver pretty much everything that you could hope for given the title? Audiences looking for a stylish western where the cowboys take down invaders from above with more than a little help from Olivia Wilde, are sure to find everything that they paid for to get themselves out of the heat on a summer afternoon. ← Movie Review: Crazy, Stupid, Love.